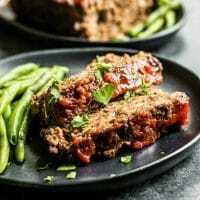 Low Carb Meatloaf that tastes great! In an effort to watch my carbs, I’ve been on the lookout for recipes that not only are low in carbs, but tastes great where everyone in the family can eat the same meal. I found this meatloaf recipe you have to try! *Disclaimer: We are not certified nutritionists. These nutrition facts are calculated using MyFitnessPal and should only serve as a guide. Nutrition facts vary between brands so you should always calculate your own based on the ingredients you use.